I actually didn't start reading Sarah Dessen books until this summer. The Moon and More is my second novel by her (the first being Along for the Ride) and I completely loved it. I've already checked out several more of her books from my library. Her books are the perfect mix of lighthearted and thoughtful. I've noticed several other people remarking about this, and it's oh-so-true: Dessen has an amazing ability to create heroines we can relate to. None of Dessen's heroines are brave and tough like, say, Katniss Everdeen or Tris Prior. Instead, they're quiet, introverted characters who are trying to figure out what they want in life. I love this, because although I love characters like Katniss, in reality I'm very shy and introverted. So I really appreciate how Dessen's heroines are so relatable. Can I just squeal over how well-developed all the characters in this story are? Because DANG. These characters all had their own little quirks and were constantly surprising me with their character arcs. I loved Emaline's mother and the advice she gives Emaline. I loved how Emaline knows the difference between what makes a father and what makes a dad. I loved the adorable relationship between Emaline and her little half-brother. All the relationships in this book are so complex, realistic, and well-done. Now I know why people gush over Sarah Dessen. Aside from the amazing cast of characters she creates, there's also the lovely thought-provoking quotes. There were so many passages and lines I wanted to highlight and reread. 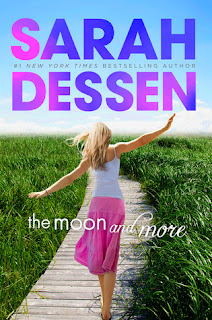 It's like Dessen has captured all the questions spinning in a teenage girl's mind, added a sweet summery setting, mixed in unexpected characters and dialogue, and the end result is the perfect summer book. What more can I say? Sarah Dessen's books are a must-read. If there was anything I had to criticize, it's that at first, there seems to almost be too many characters. I know I got confused a few times keeping track of them, but it's only in the beginning. After that, everything flows fine. And the ending? I love how things are resolved. It's unexpected yet so very fitting. I can't wait to read more of Dessen's work!